We hadn’t been to Hot Kitchen in over two years. We didn’t stay away because we had some bad meals. No, it was more like we moved on to new places. We liked it well enough but we liked some other restaurants more. On a whim we went back to HK last Saturday and we were very pleasantly surprised. The place has gotten better. Lots better. 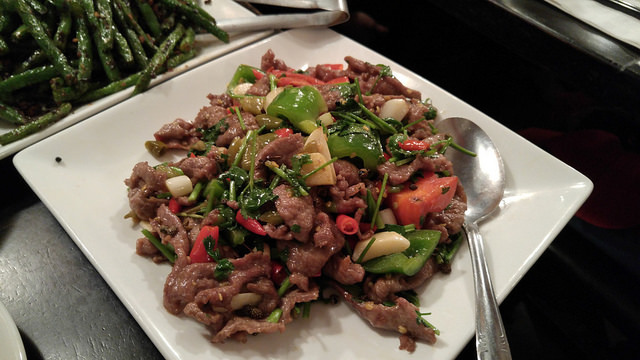 We’d ordered the green beans with diced pork before - it was a good solid version. This time around it was just terrific. They added a light dusting of Sichuan peppercorns to the dish, something that we’d never seen before. It gave the dish a pleasant extra kick without overwhelming it. The portion was vast - it could have fed four. Mains were Sauteed Lamb w. Red Pickle Pepper and the Soft Bean Curd Pudding w. Sliced Flounder. This lamb dish was new to me. The red and green peppers supplied sweetness, not heat. That came from conventional black peppercorns and there were plenty of them. The only negative is that some of the peppercorns weren’t ground as finely as the should have been. About every 4th or 5th bite there was a little crunch of peppercorn. The first crunchy bite was an unpleasant surprise but once you knew the crunch was coming it wasn’t so bad. Other than that the dish was flawless, a nice balance of hot and sweet with great lamb flavor. The fish main actually can also be found at Legend where they bill it as “Cheng Du Hot & Spicy Fish Filet." 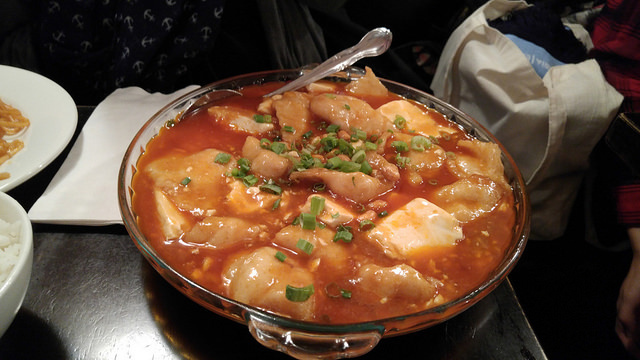 Hot Kitchen’s use of"soft bean curd pudding" was their way of referring to mapo tofu. This is quite similar to the version served at Legend, a good thing. The broth is a bit spicy but not overwhelming. My GF rejoiced to find that the fish was in fact flounder, not the dreaded tilapia. Very good indeed. Another winner. The portions were so generous that we took a lot away with us. The green beans and lamb both reheated very nicely. As is often the case, the spicier dishes gain heat overnight in the refrigerator. I probably could have used a side dish of rice last night to balance the increase in heat of the lamb. The green beans were perfect. Tonight my GF will have her fish - she’s looking forward to it. I suspect it will make 2 dinners. On Saturday night Hot Kitchen was jumping - small and larger groups of young Asians kept arriving, taking the place of other groups finishing up. We arrived at around 7:00PM and beat the rush by about 20 minutes. Yelp says they take reservations but I’m not sure if that only applies to larger groups. I’m going to try to reserve next time. For a place that was serving a number of larger groups the noise level was very tolerable. There was a birthday celebration at a table about 20 feet away and we heard the occasional whoop. That was fine with us. It’s the groups that constantly shriek that cause us to reach for the tasers. This is a bright lights Chinese place - you come for the food, not the romantic ambiance. On the other hand if your date really loves Sichuan food they’d be very happy here. I recognize the writing style. Welcome aboard. It’s like a fingerprint, isn’t it. True, but what almost threw me was that the pictures were in focus. I read this yesterday on Chowhound, didn’t I? I haven’t noticed a change at Hot Kitchen; it’s seemed quite steady to me, with my one major disappointment being the sometime gross excess of corn starch in the hot & sour soup I get as part of lunch specials there.